Manufactured By: Rockwell Manufacturing Co.
Small 37-220 Rockwell-Delta jointer, circa 1970s, in good shape with extra set of blades and new driving belt. It has been repaired in the adjustment block; I made a clamping arm and repaired clamping block as it came without an arm, which is why it is longer than the usual part shown in the parts book. 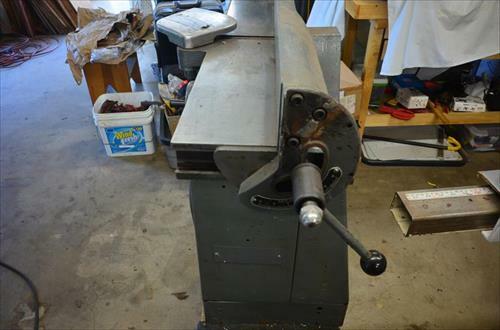 This is a jointer made in conjunction with Delta in Pittsburgh, PA rarther than West Chester, PA.
Has sheet metal base and a single phase motor with new belt. Is pretty clean with a sharp set of blades and no apparent bearing problems; comes with extra set of new blades.